A gruelling five straight away-match road trip for Northants will hit halfway on Sunday afternoon with a must-win Twenty20 match at bottom-placed Derbyshire Falcons. The challenge is testing the squad’s resilience, and hopefully solidifying Northants position and ambitions in both the Twenty20 and the championship over this three week period. I will be happy if we sit fourth in both tables come our next home match in mid-July. It all kicked off last Friday night with one of the Steelbacks’ better victories, with a rare triumph at Worcestershire in the T20, and scoring 193 in the process, our highest by far in the tournament there. It’s always slow and low down the by the River Severn, but the players fancied their chances and even with David Willey injured and unable to bowl they held out. A brutal 31 from Willey and then a blitzkrieg from Rory ‘Fury’ Kleinveldt, coming close to a world-record fastest 50 before being caught on the ropes on his 12th ball for 42, the highlight of the batting. The fastest ever 50 was 12 balls by Yuvraj Singh of India in an international, and the fastest domestic Twenty20 was 13 balls by Marcus Trescothick. The way Kleinveldt bats by simply throwing the bat at anything he may well break that record! Steven Crook also impressed with his more measured 56 not out, and 15 Northants sixes at Worcester was top end terrific for the 50 or so Northants fans that made the trip. It was tricky to defend with the loss of Willey, but Alex Wakeley skilfully got around it as Kleinveldt completed his man-of-the-match performance with two for 25, by far the best bowler on display for the tw-run last-over victory. Last Saturday’s match in front of 10,000 at Trent Bridge was more predictable, and the ground continues to be graveyard for the lads, failing to beat then in 12 straight games and all seven Twenty20 encounters. Along with Sussex, Notts are the only team we have never beaten - and if you’re interested, we have never lost to Hampshire or Surrey. The Steelbacks’ 173 for fve, built around Josh Cobb’s excellent T20 career best 84, was well short, and Adam Rossington’s late assault of 28 off 11 was not backed up by anyone else. You need 200 against a powerful Outlaws batting line up to have any chance at Trent Bridge, and Michael Lumb, James Taylor, Riki Wessels and Samit Patel got up with nine balls to spare. Wakeley tried to juggle seven bowlers but no luck this time around, and so we suffered our first defeat for 6 games. Any other business this week was a testing championship match against Lancashire at Old Trafford, with Northants seemingly still in two minds weather to have a run at promotion. For me the lads only ever want to win, and the draw policy is counterproductive. But it was another flat one in roasting sunshine and the runs did flow for a batting heavy Northants. 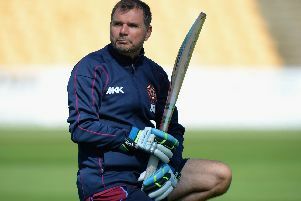 David Ripley deployed the seventh opening partnership variation of the season with out-of-favour Kyle Coetzer (in for the injured Willey) joining Ben Duckett. Coetzer was soon out for one, but Duckett piled up that second championship century, a 21-boundary 134. Many fans are unsure about Duckett and his shot selection, but for me you won’t be able to change his style, so just let him play. There were welcome 50s for Wakely, Richard Levi and Rossington as the innings closed on 438 for a second successive five batting points, not bad against the runaway leaders. Lancashire’s reply of 308 all out was a brilliant effort by the weakened Northants attack in tough conditions. The non-selection of Maurice Chambers from the 13 for this game saw Northants play just the three seamers, and at 246 for three and with Ashwell Prince set for a hundred ,it looked grim. But Prince’s his dismissal for 83 by improving spinner Rob Keogh proved critical and triggered a big collapse. Prince averages around 100 against Ripley’s Northants and I’m sure he would have got a daddy as heads dropped. So Northants were 130 on and had the straightforward task of setting a total. Coetzer failed again with just five, and I feel for Kyle. When he was told he was not needed last September with a year left you can only envisage a negative effect on him, and so Northants when you do that. A good hit by Crook and then Ollie Stone recovered the team from 166 for six for 283 for nine. Northants play positive cricket and that four an over first innings is what put Lancashire under pressure most. A safe declaration by captain Wakely set Lancashire 414 to win in around 100 overs. Lancs enjoyed only their second 50 opening partnership in 22 innings as a rather subdued Northants attack concentrated on the seamers roughing up foot holes for the spinners all morning. Lancashire celebrated their first 100 partnership for 23 innings with half-centuries for Horton and Browne as the run chase looked on at 130 without loss mid-afternoon. But haste set in and the wickets tumbled in an indecisive pursuit and panic at tea. Alas that rain swept in to close the game with Lancashire struggling on 206 for seven, and Northants were denied what would have been a huge victory. It was the first real chance to see Graeme White on a fourth day pitch this season, but Keogh won the spin battle with twice as many overs for twice as many wickets. Stone’s three 26 is yet more clues to just how good this guy can be as he gets quicker and quicker and the keeper stands further back every match. Pace is everything at this level. Maybe Wakeley could have declared earlier on Wednesday night and attacked more on Thursday morning with rain forecast, but his tactics have always been positive in the championship and this was still a cracking performance.